Greece is that beautiful country in South Eastern Europe that pops up in your mind when you think of amazing turquoise waters and breathtaking sunrises and sunsets, dinners by the sea and all the beautiful things a vacation should have. That’s right, Greece will give you an Instagram shot opportunity every 5 minutes! The islands are famous in this country, but the mainland is just as good, you just need to know where to go! So, welcome to Halkidiki, traveler! Halkidiki (or Chalkidiki) is a famous resort region in Northern Greece. The region is made out of three peninsulas or “feet”, each with its own unique charm, history and magic. The first peninsula, Kassandra, has probably the most developed infrastructure, it is the ideal place for nightlife lovers and party animals. Why? It is the closest to Thessaloniki and it is full of students coming from there. 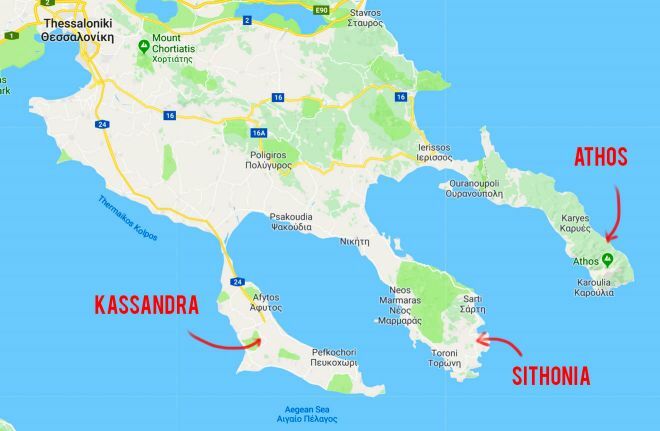 The second leg is Sithonia. 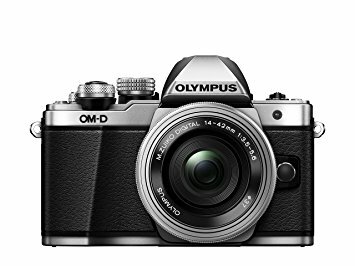 It is perfect for nature lovers (read – me!). It can offer both annoyingly blue sea sceneries and magical forests as well. 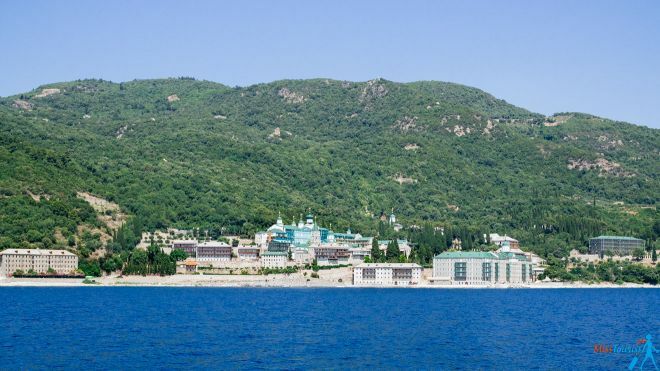 The third one is Athos, the world’s only monastic state, home to twenty monasteries. It can be visited only by men and you will need a special visa to enter the area. As I am not really a party animal lately and I can’t really visit Mt. 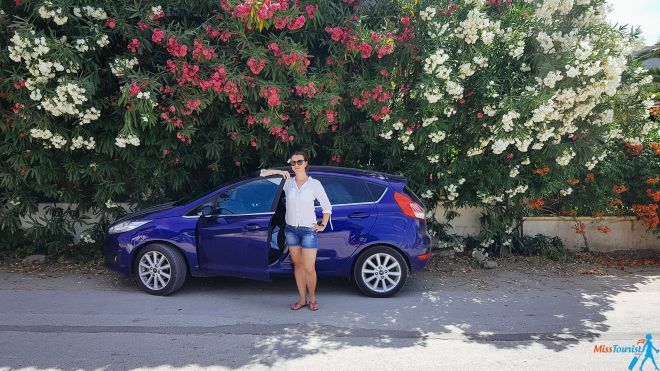 Athos because I am a woman, the choice was simple – Sithonia it is! 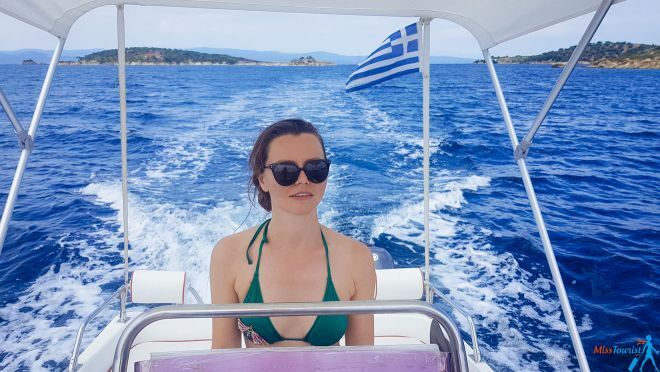 I spent most of my time visiting Sithonia peninsula so I will talk about that mostly, but I will also tell you about the tour I have taken to see Mt. Athos from the water. One important note from the start! For transportation in the peninsula – you will need a car! There is no way you can do sightseeing without it, public transportation is non-existent and renting taxis all the time would be too expensive. The roads are good, so why not rent a car for that period of time when you feel like exploring? Technically, you can go around the peninsula in 2 hours if you just drive around it. 2-3 days will be enough to visit everything I have recommended below, but please do not forget to also have a rest and just enjoy the untouched beauty of those places. That is what you are there for, right? 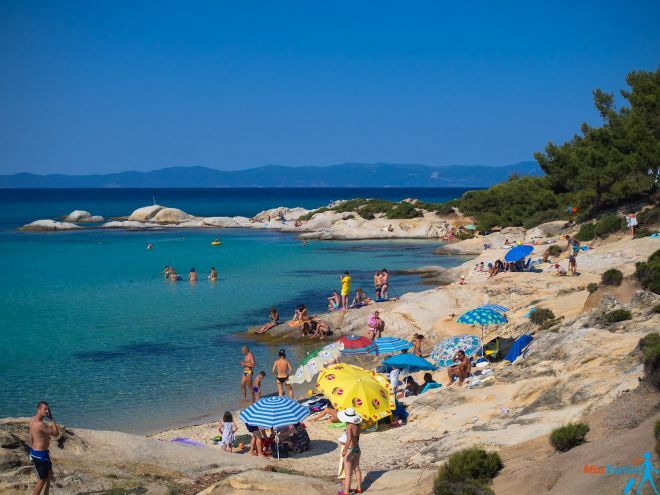 Halkidiki boasts an amazing 550 km of beaches featuring hundreds (if not thousands!) of different stunning beaches! Visiting the most beautiful ones is part of the sightseeing when it comes to Sithonia. The beaches are different – some are fancy and full of nice restaurants, some are wild and almost undiscovered by tourists. Let’s talk about the ones that I liked the most (they are in order if you would start North and going the peninsula counter-clockwise). 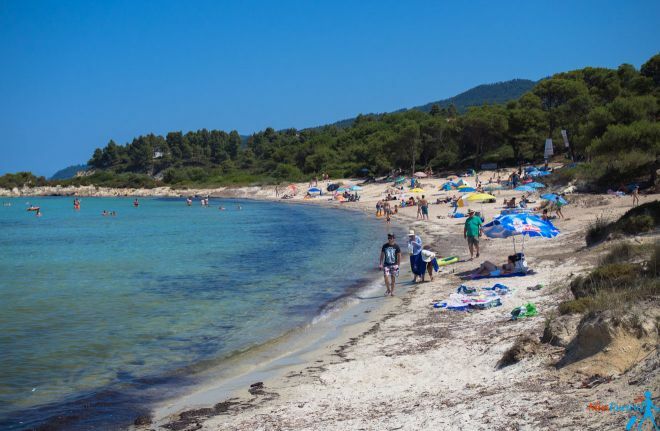 This is a very local beach that tourists don’t usually know of, so it is a great place if you are trying to avoid the crowds – it is both nice and secluded. The only disadvantage is that there are no shops around, so, if you will get hungry or thirsty, take some snacks with you! 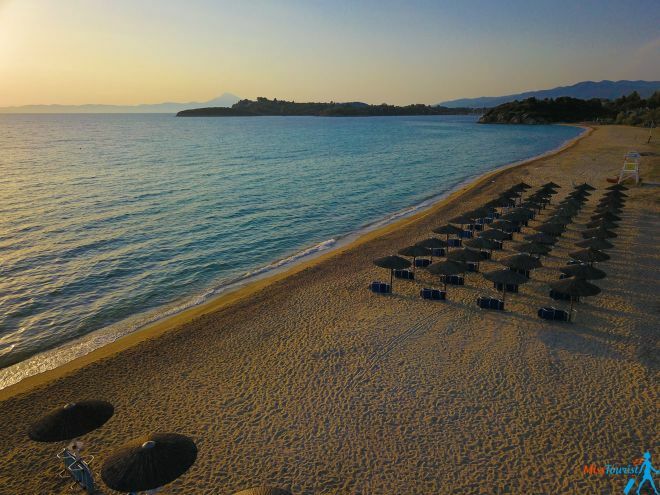 Elia Beach has about a 2 km-long stretch of coastline on Sithonia’s western shore. Some parts of it have pine trees that are perfect to protect you from the sun in the mid-day! Narrow beach that serves the local hotels, I had the impression that Paradisos beach is the most kids-friendly beach in Sithonia. There were many activities created with families in mind such as water slides etc. Kalamitsi Beach is the most southern beach of the peninsula and it has a very scenic ride to it, too! Kalamitsi is probably the longest beach and it has many water sports activities including diving! It has no pebbles and that is a huge advantage! One more great beach with crystal clear water. The bay is very sheltered so even if it is windy, the waters here will be calm. Make sure to visit Tigania Beach Bar, it is just around the corner and it has a fantastic view to the sea! The Orange Beach is also often called Portocali (which is “orange” in Greek). This beach was one of my favorite though a little crowded when we arrived. The beach is made up of many little beaches because of the coves. It’s a little rocky (best to take water shoes if you have them), but very nice with its crystal clear blue water! There is also a Mega Portokali Beach that looks more secluded to me and less known, but I haven’t been there unfortunately. Karidi (Karydi) beach is my second favorite after the Orange beach (although, again, quite a popular one). If you want to enjoy crystal clear water among the rocks, this is one of the most best beaches in the peninsula! Please note that there is just one shop where you can buy some snacks, there are no proper restaurants around. Trani Ammouda is the beach that was right in front of my hotel and also one of the best ones in my opinion. It is quiet, turquoise, long and it has good infrastructure at the same time! NOTE: There is also a beach called “Lagonisi Beach” just 20 minutes walking, so we could walk from the hotel when we felt like exploring without the car. 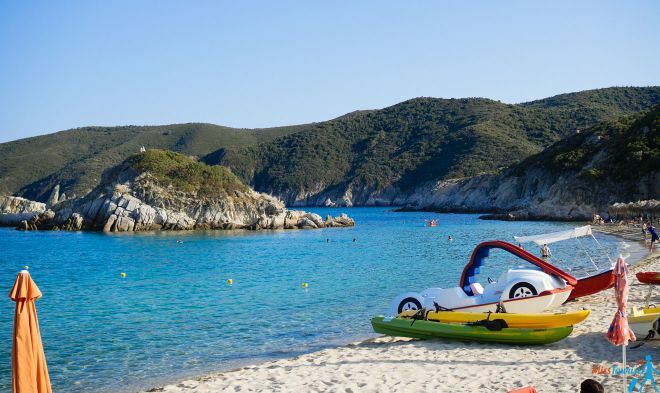 Beaches are nice, but I am sure that sooner or later you would like to discover more things to do in Sithonia, right? 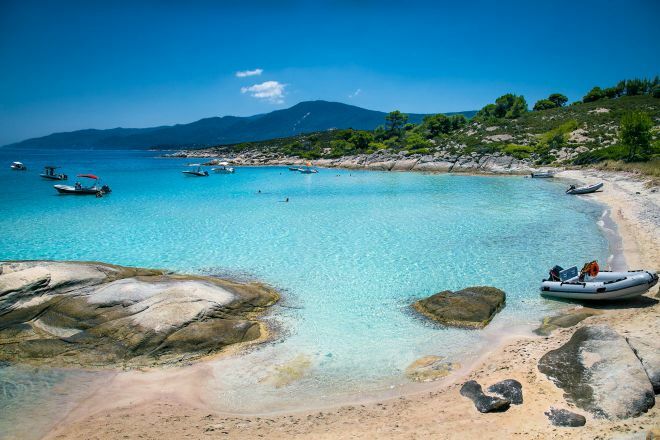 Diaporos is an island off the coast of Vourvourou on Sithonia peninsula and it is the largest island in the entire archipelago. 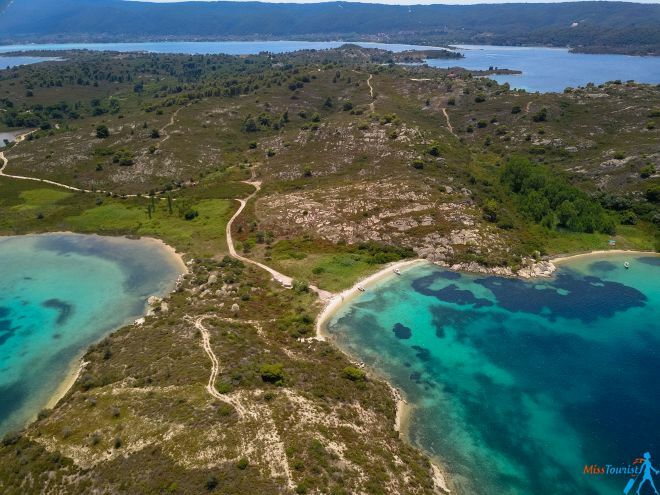 The bay is deep enough for small yachts to enter, and the natural beauty of the location is simply astonishing! In order to get to the island, you can either rent a boat or a kayak. There are no ferries to the island. The kayak takes about 2 hours to paddle around the island, if you are in shape. But to be honest, after I imagined how burned I would be after 2 hours of being exposed to the sun on a kayak, we decided to go for a boat. How nice would it be to rent a boat for a day, cruise around the island and stop in some isolated beautiful spots for a swim or a picnic? Apparently, you do NOT need the license to drive a boat, as they have small motors, but please be careful and listen to the safety instructions attentively (especially the part when they explain where the reefs are). We were completely fine, but it is not as easy as it looks. The guy who rented the boat to us said that there are more accidents happening that I can imagine. Some of them being quite silly. 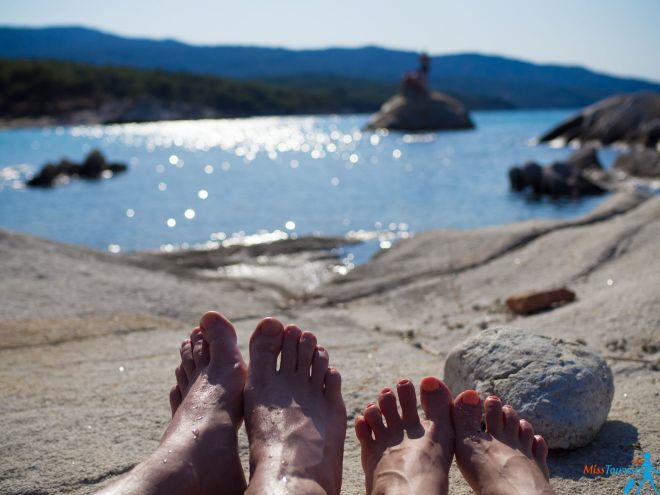 Now, about the pleasant part – it was definitely the most fun thing we did in Halkidiki! Mostly, my boyfriend was driving it, but I also managed the boat for a bit and it was SO much fun! PRO TIP: Check the weather the day before you are going, if it is really windy it is best to move your trip to the next day (as it will be too bumpy). NOTE: By the way, do not forget to take at least some snacks and a lot of water. You are going to be on the boat for many hours and Diaporos Island has maybe 1 hotel where you could get some food from. So, my suggestion is to take care of it in advance! PRICE: It is usually costs from 60€ per day depending on the boat (it usually can fit 4-6 people). The gasoline is paid on top of that separately (about 20-25€). I recommend booking well in advance, the boats sell out fast! You might find something last minute (we did), but your choice might be limited. 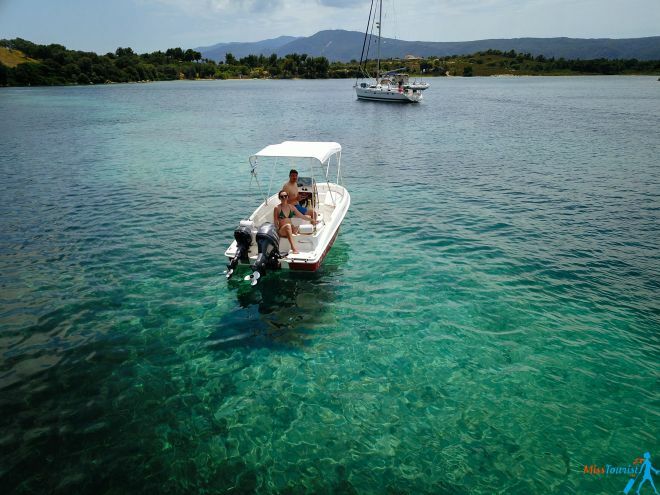 The place to go is Vourvourou – that is where all the boat rental companies are located. The third, easternmost peninsula of Halkidiki is Mt. Athos, a home of unique Orthodox communities and monasteries. This place is solely dedicated to prayer and worshiping of God. Mt. Athos is under UNESCO World Heritage protection and it is absolutely forbidden for women to enter. Men can enter the territory to see the monasteries from up close or to hike the untouched nature there, but they will need to obtain a special permit upon entering this autonomous zone (it is not hard to get one, though). The cruise takes about 2,5 – 3 hours during which you will see 8 out of 20 monasteries built on the peninsula. The info is also in English and in numerous other languages to help you find out the story of the place. NOTE: You might want to take some bread to feed the seagulls. It is so much fun to watch them follow you all the way! PRO TIP: Stay on the left side of the boat to see the monasteries better, on the way back the boat won’t get so close to the shore to shorten up the way back. 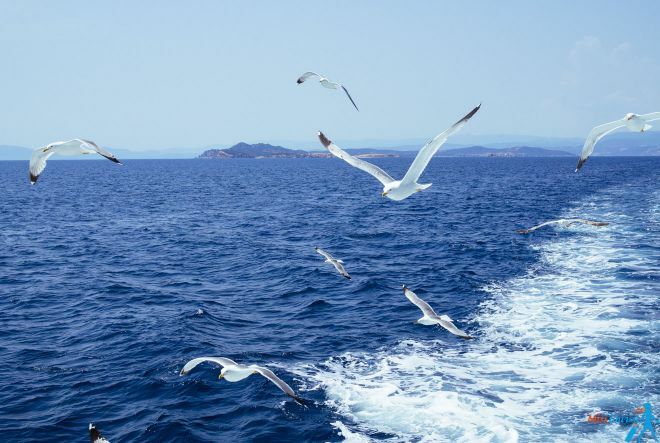 I also recommend staying at the end of the boat because this way you will see the seagulls better (and they were quite an attraction by themselves!). 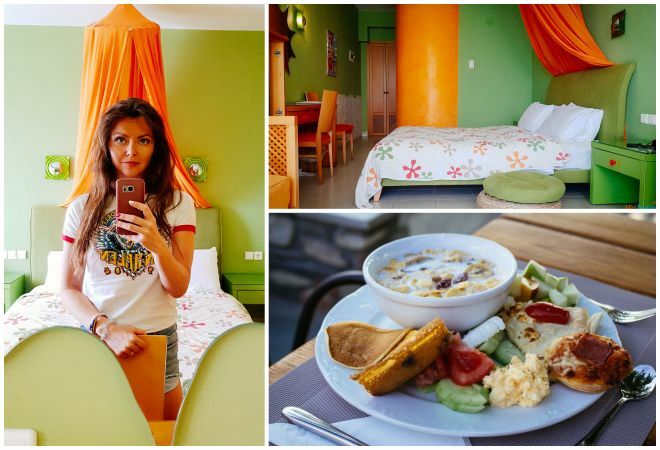 PRICE: The price was 20€ and we booked it from our front desk (more on the hotel later in the article). 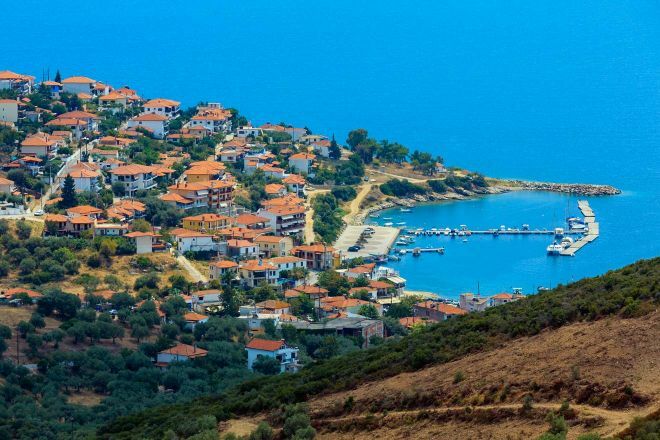 Nestled in between Sithonia and Athos peninsulas, Ammouliani Island is a perfect vacation place for people who do not want to travel far. Hotels choices are plentiful, so you would not have any problems with accommodation if you would want to stay for a couple of days. If you want to visit the island as a day trip, it can be easily done. The boat leaves at 9 am and comes back at around 5, the cost is 30€ per person. NOTE: Make sure to visit Alikes Beach on Ammouliani Island, it is very beautiful! Parthenonas is a remote historical village that is worth stopping by in between your beach hopping, as it is quite charming! It has a spectacular panoramic view which makes it a perfect spot for a siesta! There is even an Original Folk Art Museum, but I haven’t been there. 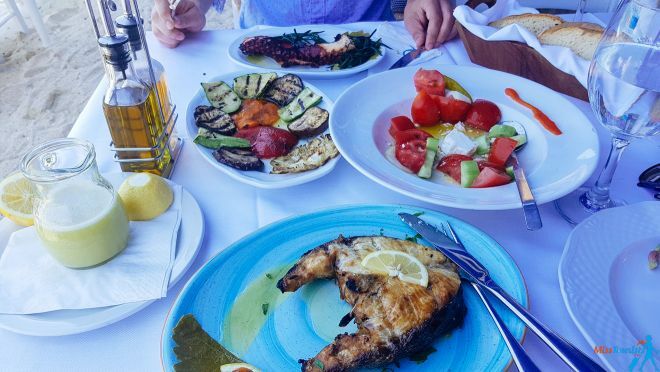 I ate gyros, Greek salads and seafood, I also drank amazing Greek wine during the whole vacation time – this is what I call a Mediterranean diet! Everything in Halkidiki was delicious because the food is prepared from the purest of ingredients! 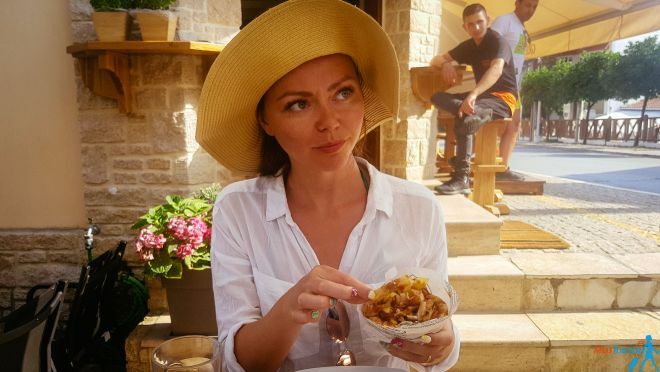 Even so, here are my recommendations for some good restaurants and amazing beach bars (I haven’t been to all places on the peninsula, but here are the ones that I tried and liked). Aristos – my favorite place! It is an excellent seafood tavern with fantastic service where you can eat with your feet in the sea! I got an amber jack stake and it was so delicious! Ethnik beach bar – visit it for the best sunset on the peninsula! There are plenty of choices for all wallets on the peninsula – you can choose from a wide range of hotels, guest houses or apartments. Antigoni Beach Resort is a great choice for both couples and families with kids, it is a charming place where you will find pure relaxation! It is a quiet middle-sized hotel with 50 rooms right in front of the sea. I stayed in a junior suit with a sea view and I could not be happier with it! All rooms are individually decorated, so yours will be special and you are welcome to give preferences on where you want to stay when you book! Also the rooms are super spacious, we even had a special closet only for luggage! I liked that the rooms were arranged in such a way that other guests would not bother you. Our neighbors were a family with a child and I only heard them when they went out of their room. The breakfast has a huge selection of dishes and you can find everything from traditional English/continental breakfast to a large variety of Greek options. I loved that it does not get boring even if you stay for a long time! The beach is literally in front of the hotel and the beach towels and chaise longs with an umbrella are provided. 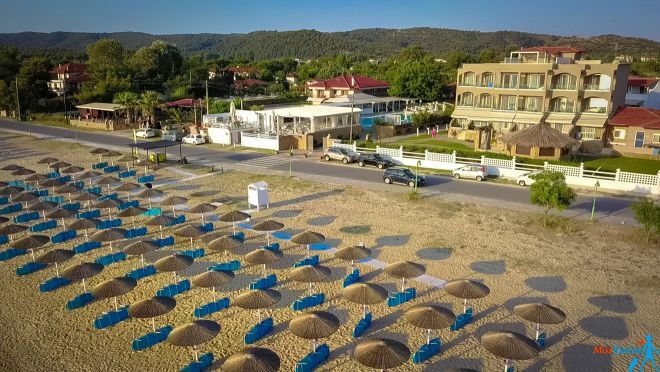 The beach name is Trani Ammouda and it is one of the best beaches in Halkidiki in my humble opinion: there are no pebbles, it has a nice soft sand! If you don’t feel like entering the sea, there is no problem, they also have a nice pool! The hotel has a very nice garden where in June there were many sweet peaches that we could eat right from the tree! The front desk was extremely nice! I asked them quite many questions and they were always happy to help. In fact, they recommended me some of the hidden places in the list above and you can also book any tours through them if you wish to. I remember that we forgot an adapter for my drone at home and the front desk was ready to provide it – they had numerous adapters for different countries, so nice! No wonder why the reviews of this hotel are fabulous, check it out yourself here. NOTE: If you do not want to rent a car (more on this below), Antigoni Hotel can arrange a transfer from the airport for you. If you do have a car, they have a parking for hotel guests where you can leave your car under the shade. As I said above, there is no way you can properly visit anything in Halkidiki if you don’t have a car. If your plan was to enjoy the turquoise sea and the swimming pool in your hotel, that’s totally ok too, you obviously do not need a car. But if you feel like discovering, you will need a vehicle. The roads were great, it was a pleasure to drive around. Check the offers of all international chains and locals suppliers here. I like this site because you can easily set all the conditions that are important for you in one click. Conditions like unlimited mileage, second driver, baby seat – all of this is super easy to set up in the system. They also have a best price guarantee policy, so you can be sure you will find the best rate! The season is from May to October and I think the best time to go is on the first half of June. The beginning of June is the time when the water is already warm enough to swim, the crowds of tourists are not there yet and the weather is warm, but not too hot! I have heard that the beginning September is also nice. The easiest way is to fly to Thessaloniki and then to rent a car or use a transfer provided by your hotel. Depending on where you are and which peninsula, it will take a minimum of 45 minutes. It was 1,5 hours to my hotel, Antigoni Beach resort. 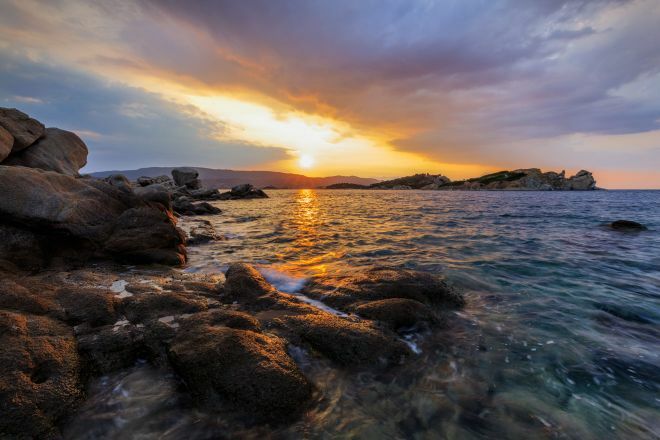 Halkidiki region has the perfect combination of unspoiled landscapes, turquoise colors, rich culinary fare, great nightlife and religious traditions! 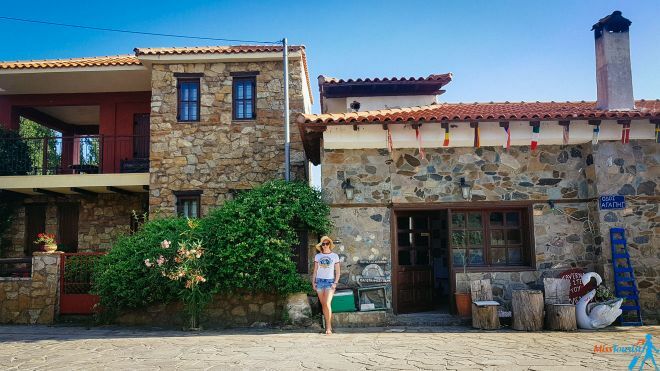 Everyone will find what they want there – be it a family vacation, fashionable stay, extreme activities or secluded intimacy – Halkidiki has it all! 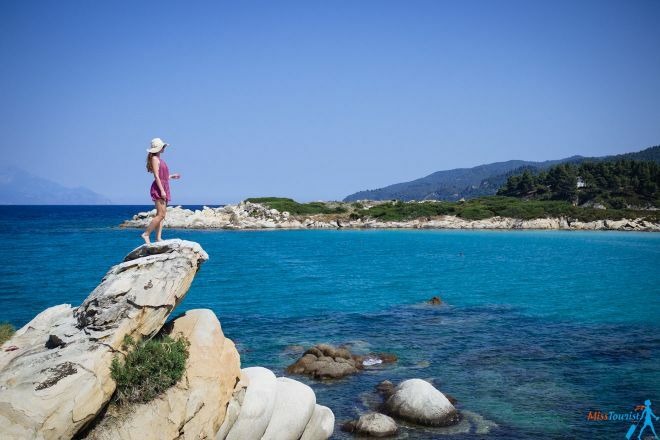 I hope my suggestions on things to do in Halkidiki were useful for you and you will use them to plan your vacation! 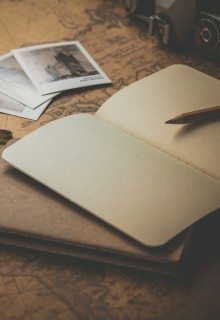 If you have any more questions, be sure to let me know, I love receiving comments from my readers! I hope to visit Greece some day.